The Sunday Times EFG Short Story Award! To read the story, which was originally published in American Short Fiction, click here. It’s official: Remember Me Like This is an international bestseller! Gratzi, Italia! The Writer’s Center has chosen Remember Me Like This as the winner of the 2015 McLaughlin-Esstman-Stearns Prize! The paperback for Remember Me Like This is now available! It’s official: Remember Me Like This is a national bestseller! Sincere thanks to all of the readers and booksellers who made this happen! RAVE review in The New York Times Book Review! To read the full review,click here. 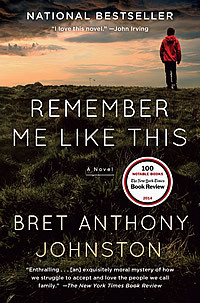 To buy a copy of Remember Me Like This, click here. BAJ on Weekend All Things Considered! Arun Roth did a great interview with Bret on NPR’s Weekend All Things Considered! Remember Me Like This hits the bestsellers list! On May 25, Remember Me Like This debuted at #5 on the Boston Globe’s bestsellers list! Remember Me Like This AVAILABLE NOW! The early reviews have been amazing, and now Bret’s new novel, Remember Me Like This, is available everywhere–in hardback, eBook, and audiobook! Here’s a sample of the incredible buzz that sent the novel into a second printing even before its release! Click here to buy your copy today, and please spread the word! Happy Reading!